Our 'How to Stage an Opera' series offers different perspectives on the practicalities of staging an opera, from the initial research through to the final performance. Stand in the middle of the empty main stage of the Royal Opera House and you will feel small. The stage is nearly fifteen metres across and nearly seventeen metres deep. The bottom of the proscenium arch hangs more than twelve metres above. If your preferred unit of volume is the red London bus, then the stage would fit around thirty-three and a half. For those tasked with the creation of a new production on the main stage, this huge space is their playground. 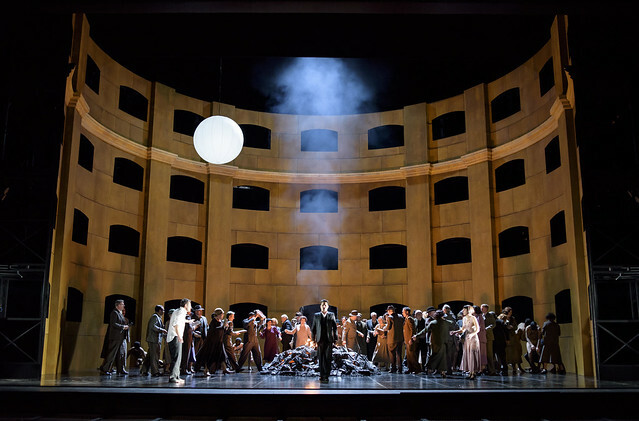 In their production of Karol Szymanowski’s Król Roger, director Kasper Holten and designer Steffen Aarfing continually use placement within this massive stage to deepen the meaning of their design. It begins in complete darkness, while unseen singers intone a monumental communal prayer. As the music grows in intensity, lighting and video design by Jon Clark and Luke Halls slowly illuminates an immense, monolithic structure that dominates the stage – a giant head, eight metres tall. Kneeling before it we see the ant-like King Roger. The Archbishop’s voice, leading the congregation, sounds high above the stage. We realize that the head is cradled in a classical coliseum, three stories high, peopled by worshipers. Roger’s smallness before the statue is then balanced by the authority apparent in his distance from the people, in his centrality before them. 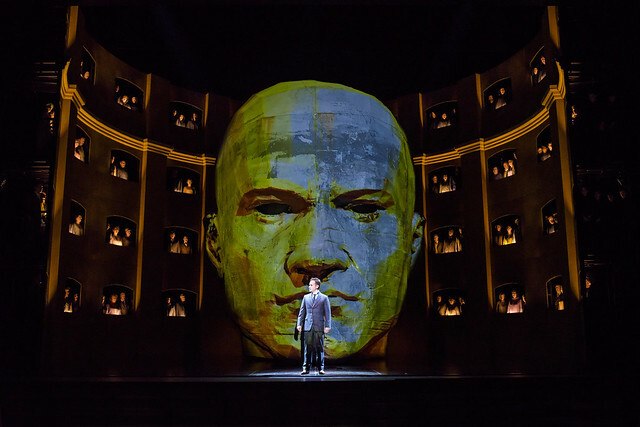 Within the first two minutes of the opera, Holten has used the space of the stage to establish one of the opera’s dichotomies: Roger’s authority as a leader and his self-doubt as a man. 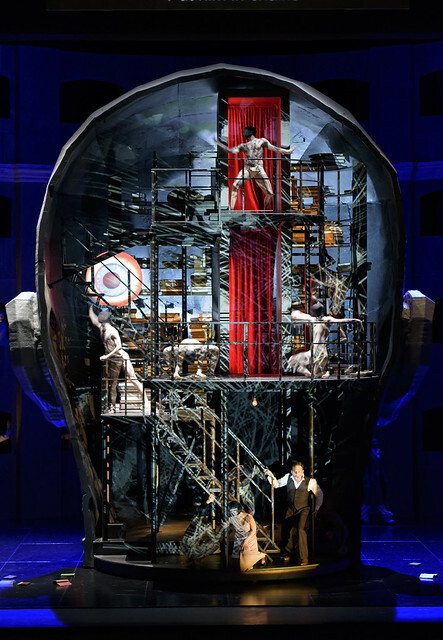 In Act II the head revolves to reveal its interior, a cramped space of books and staircases in three tiers. There are three striking features: a blood-red curtain that appears to span the upper two levels; a large globe lodged roughly at the statue’s eye level; and a pile of semi-naked bodies that slumber in the lower section. Each serves a visual function, enlivening the stage picture; and each carries its own symbolism within the dilemmas that face Roger and his queen Roxana. That of the inert figures is clear: they represent Roger’s sensuous self, suppressed in his pursuit of knowledge and rational control. The globe and the curtain are more open to interpretation, but no less eloquent. The curtain quickly becomes associated with Roxana – she enters through it in her sensuous siren-call of an aria. It is only at her entry that the double length of the curtain is fully illuminated and its prominence within the stage picture is revealed. This significance seems to foreshadow Holten’s revision of the ending, where Roxana does not leave with the Shepherd but aids Roger towards a new realization of his self. It suggests at a different kind of sensuality within Roger, obscured but present, quite different from the violent energy of the writing creatures below. The globe is one of the few visual consistencies across the cataclysmic change in stage picture between Acts II and III, where the head is reduced to a smouldering heap. In this barren landscape it becomes a distant, unknowable moon, touched only by the heavy smoke that rises from the rubble – quite a difference from its meaning in Act II, although its dimensions and location have remained largely the same. Here it begins as a model of the world, a symbol of Roger’s learning and dominance; on the intrusion of the Shepherd it transforms into an inward-looking eye, the pupil of which steadily dilates as the Shepherd solidifies his hedonistic power. Through this, and through other images, Holten and Aarfing use the massive space of the stage to explore the internal and the introspective. Read other posts in our ‘How to Stage an Opera’ series.